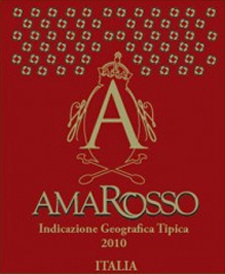 Amarosso is a very intense and complex wine, with a wide array of flavors and aromas. Deep ruby red, this heavyweight wine exudes aromas of sour cherries, dark chocolate, stewed plums, dried fruits, anise, raisins, bitter almond, tobacco, leather and molasses, and has a spicy-earthy bittersweet finish that lengthens on indefinitely from the huge volume of tannins. Delightful with food, Italian Amarosso is often enjoyed by itself, sipped outside of mealtimes with good conversation and good friends. If Italy is the largest producer of wine in the world, it is largely thanks to Puglia, which produces more than any other Italian region, about 17% of the total! Puglia is a long, thin wine region in the far south-eastern corner of the 'boot' of Italy. The hot Mediterranean climate, persistent sunshine and occasional sea breezes make for a near-perfect environment for viticulture. The region is responsible for almost half of Italy’s total olive-oil production and has a long-held reputation as a prolific source of (mostly red) wine. The most obviously full-blooded Puglian grapes are Negoamaro and Primitivo. Almost exclusively cultivated in Puglia, Negroamaro is used to produce some of the region’s best wines. The most famous grape is Primitivo, generally high in alcohol content and full in body. White wines in Puglia count for less than 20% of the overall production.